"I have a great idea" is a phrase that is often met with equal parts eye-rolling and a fast exit from the room. While ideas are never in short supply, it's the get it done potholes that reduce them to vague wishful notes and missed opportunities. There's something about the promise of a genius idea that begs to remain in its pristine, hopeful state. The reality is ideas have to get a little messy if there is going to be any practical progress. Recently I found myself with a long list of projects, priorities, and unformed ideas. As I typically do, I began the process of organizing, categorizing, and ranking. It was soon very evident that it was time to make a change. 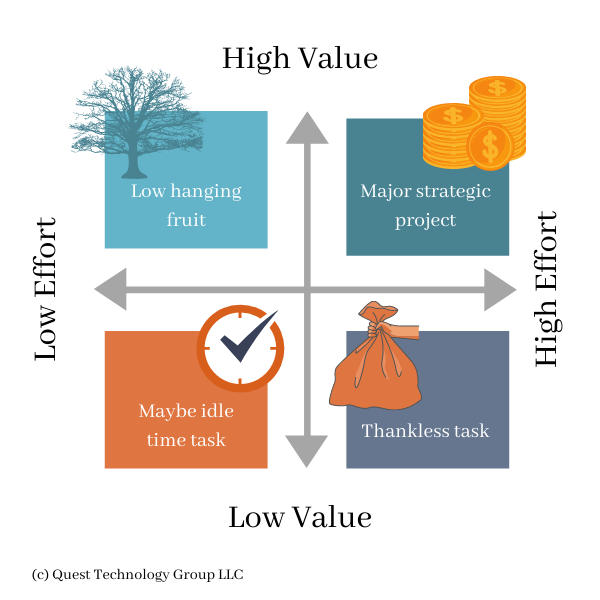 We've all seen some variation of the pick-a-quadrant approach to idea prioritization. The simple matrix provides decision squares in which we stick our let's do it pushpin. What we need first is an orderly, repeatable process that ultimately lands us in the right square. Planting our pushpin is the result of a well-thought out analysis. I confess that I can view the process of deconstructing a beautiful idea to be tedious and deflating. However, on this particular day, I decided to give it a go. Starting with one of my top priorities, I created the Idea Triage Workbook. Each column was a key point that had to be fully explored before taking any action on the project. As inventor, engineer, businessman and patent-holder Charles Kettering once said, "A problem well-stated is a problem half-solved." Each of these points is a topic in itself. For now, these short tips will help jumpstart your thinking. 1. Why Should We Consider This Idea? In the spirit of Simon Sinek's Start with Why, the first question to answer is "Why Consider It?" The answers must be phrased in the customer context, not from an internal company-first focus. As I began filling in the rows in no particular order, the clarity that quickly took shape was amazing. The remaining columns quickly began filling up with one thought often leading to another even more focused insight. 2.	Who is This Product or Service For/Not For? This sounds obvious, but it's tempting to rush past this question. When we have grown attached to an idea, there is an unconscious assumption that the audience of everyone will respond the same way. That is a false assumption. Take the time to clearly define who your customers will be. If you have defined (and I hope you have done this), these can be an excellent starting point. However, you'll want to keep an open mind. You just might have the potential to reach an unexplored market. It's equally as important to define who your customer for this product or service is not. Again, your buyer personas will guide you in staying true to your target audience. 3. What Is Needed to Develop This Idea? The purpose of this step is to realistically identify the impacts to your organization. 4. What Resources Will We Need to Execute? As you iterate through the worksheet columns, you will likely find yourself adding to and refining what you will need to execute. For example, market research can change the scope or direction of a new service. It can be tempting to dismiss subtle shifts based on existing internal skills. Rather than making a premature decision, simply add these needed resources to your list. 5. What are the Possible Obstacles to Execution? Charlie Munger, Berkshire Hathaway vice-chairman and long-time Warren Buffett business partner takes a what-can-go-wrong approach to success. Munger says "Invert, always invert: Turn a situation or problem upside down. Look at it backward. What happens if all our plans go wrong? Where don't we want to go, and how do you get there? Instead of looking for success, make a list of how to fail instead." Taking a critical view of an idea we're passionate about is hard. It forces us to be painfully objective and look for the flaws that we don't want to see. However, realizing this exercise can ultimately save substantial time, money and professional credibility helps reduce the resistance. 6. What are the Potential Revenue Sources? The purpose of creating a product or service for our trusted customers is to return mutually meaningful value. The Golden Guideline places the customer at the center of the products and services we deliver. That doesn't mean that we neglect the financial health of our organization. Customer value and organizational well-being go hand in hand. When we have that next big idea, "how will we generate revenue" isn't far behind. What are interesting to explore are the less obvious income sources. As you continue to define the value you will deliver to your customers, you might discover not only new features but also innovative revenue potential. 7. What is the Expected Outcome? This goes hand in hand with why you are considering your idea. It is here that you put a fine point to the tangible results of your investment. The outcomes should align with your clearly-defined company goals. 8. What Are the Measurable Metrics Needed? Quite simply, how will you know that you have achieved the expected outcome? As you identify and detail the resources needed to consider and execute your idea, be sure to include the tools that will help you measure results. For example, if an expected outcome is increased customer engagement with your how-to webinars, does your webinar platform provide metrics such as frequency of user attendance, chat participation, materials downloaded, and link sharing. There are many excellent resources available in this area, and we won't attempt to dive into them here. However, if you want to learn more about the successful goal-setting and measurement practices of giants such as Intel and Google as well as fledgling growth startups, Measure What Matters by John Doerr is a recommended read. 9. What Are the Likely Time and Costs Needed to Execute? This brings us to the final question in the idea decision journey. As you consider the time and costs to execute, keep in mind the less obvious trade-off costs. For each idea you decide to advance, there is probably another one that will have to wait. Time and resources are not in unlimited supply. You will need to weigh the overall value of choosing one idea over another. Conversely, there is also the lost opportunity cost of not executing when you should. Your careful consideration of the first eight steps will help guide you in uncovering inactivity costs. Time and financial costs are not always linear. Now it's time to push your pin into the quadrant where value and effort intersect. Both the process and the results completely surprised me. Even more eye-opening was the moment the next day when I found myself with another initiative to consider. Without even thinking about it, I created another worksheet in the Idea Triage Workbook and began writing. The cadence of focused analysis no longer felt like I was spoiling creativity. Instead I was giving my great idea a purposeful, measurable shape. After you've tried the Idea Triage Workbook, I would love to hear from you. How did it help you turn a great idea into an actionable project?